SEATTLE – A winter storm pounded Washington state Friday, forcing the cancellation of 200 flights in Seattle as officials worked to get people off the streets and into shelters during the nation’s latest bout with winter weather. Snow began falling north of Seattle with some areas recording 8 inches of snow before it made its way south and enveloped the city. Crews had to travel by snowmobile to get to the lodge in mountains east of Fresno. Heavy equipment and crews then cleared more than 20 fallen trees and 8 miles of deep snow on the road leading to the lodge to allow guests and staff to leave the property Thursday night. 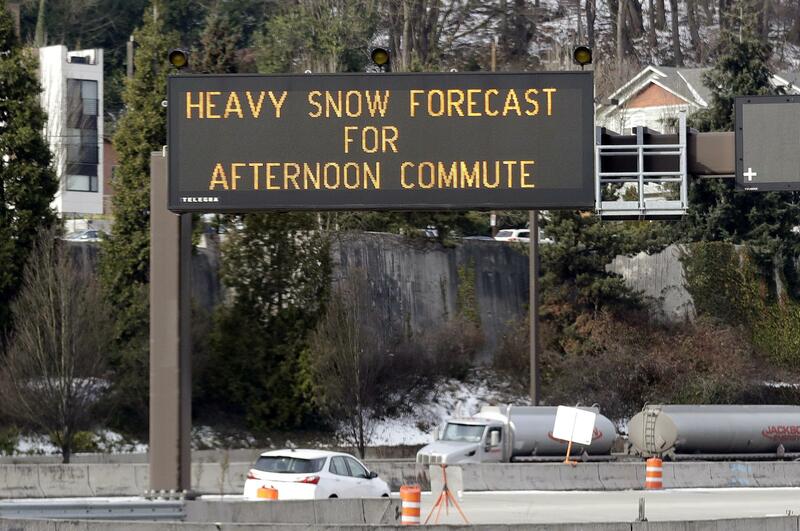 Forecasters said Portland, Oregon, could get up to 4 inches of snow later in the day, with two more snowstorms expected to hit the city next week. Published: Feb. 8, 2019, 4:09 p.m. Updated: Feb. 8, 2019, 5:26 p.m.